“If you can solve your problem, then what is the need of worrying? Entering 2018, it was felt that momentum driving markets from mid-2016 was unlikely to continue, and the volatility which was absent in 2017 would return. As an observer of investor behaviour, people are happier when markets are going up but feel sadder when they go down. Worry tends to creep in, especially when markets are falling. 2018 has been the opposite to 2017 so far, and can only be described as a difficult year; February was a crazy month which saw the Dow Jones index fall 12% in two weeks, then some of that recovered and fell again at the end of the month. Much of this was caused by fears of inflation in the US, which seemed to indicate the economy could overheat and force the Federal Reserve to raise rates more quickly. With stocks at relatively high valuations a pull back was going to hurt. March hasn’t been that much better; clearly investors are nervous. The “scandal” engulfing Facebook has negatively impacted other companies both in the US and the UK. And, in recent days the potential for a global trade war shows that markets were not prepared. The sell-off is a mechanism to start pricing this in. The feeling is that 2018 could be an uncomfortable year but it doesn’t mean it will be a negative one. In the US corporate profits are booming, the EU is growing, and Emerging Markets are doing well. The Global Recovery is continuing, and this shouldn’t be ignored. Markets are not always a reflection of what is happening on the ground; the fundamentals that drove returns in 2017 remain but when investors get nervous this can be dangerous, as sentiment often drives down the markets further. We are at the late stage of the recovery cycle, but the cycle is not a normal one. This has been relatively flat since 2008 and only gained momentum in second half of 2016; many still feel that this could run for two to three years. There are risks which we will highlight in more detail which could impact global growth, but there are also some positives which shouldn’t be overlooked. We will start with the US markets. In hindsight it is of little surprise that Trump started a trade war; fulfilling promises made in the election. Logically many, including myself, felt to embark on this route would be utter madness. The opening gambit seems to be $60 billion of tariffs on imports from China, which has responded with a counter-attack of $3 billion of tariffs on US products. The Chinese response doesn’t seem high, but it seems they will also use non-tariff barriers on US companies. It is this that has driven down the share prices of companies like Boeing and Caterpillar. Boeing are producing their 787 for China Southern Airlines and Air China. This leaves them as a sitting duck in any trade war, dangerously exposed and potentially excluded from one of the fastest growing markets. China currently accounts for a fifth of Boeing’s deliveries and long term, if this changed, this could have a serious impact on the company earnings. Caterpillar have been investing heavily in China and could be impacted by non-tariff barriers. They want to be part of the largest construction and mining equipment market in the world and these moves by Trump have made investors nervous about the long-term effects. Markets clearly had not priced this in, so we saw a big sell-off. Despite all the positives from global growth, the markets are now trying to digest what impact this action will have. This could easily hurt other economies. In Europe there are discussions on putting tariffs on US products, so this could escalate. The drivers of the markets in the US in 2017 were the big tech companies; the “scandal” that has hit Facebook not only hurt its share price but other companies in the US and UK. It shouldn’t have been a surprise that data was being used to monetise its product. It is a free service; how else does it make money? But then the question arises as to how Google (and others) makes money? But it is not all bad news in the US. The new Fed Chair Jerome Powell is in place and the markets are watching with interest. The expectations for rate rises vary but we expect at least three this year and perhaps three in 2019. By 2021 rates are expected to be pushing towards 3.5%. Still a lot lower than what we have seen in the past but a significant increase. On the downside this does leave some zombie companies exposed; Toys R Us announced its liquidation and a week after the announcement its founder Charles Lazarus died at the age of 94. A victim of the online retail boom, but also saddled with billions of dollars of debt. Another company which filed for bankruptcy was the 200-year-old gun company, Remington, again saddled by debt it had no choice but to try and write down. As rates rise we should expect to see more companies disappear, but the outlook generally for the US is good on the back of increased government spending and tax cuts. Across the Atlantic the UK seems a less happy place. Bank of America Merrill Lynch produced a poll of global investors, showing they like emerging markets and banks, but hate healthcare and bonds. The most unloved or hated sector / region is the UK! The two main reasons appear to be uncertainty around Brexit and what impact this might have economically, and secondly the growing prospect of a Jeremy Corbyn government. Touching on Brexit we shouldn’t underestimate the deal which led to the ‘orderly withdrawal’ of the UK from the EU. The 21-month implementation period is an important step but there remains big challenges especially relating to the Northern Ireland border. Although business investment is up slightly, this is well short of the long-term average. We have seen Unilever consolidating its headquarters in the Netherlands, abandoning the UK base it has maintained for nearly a century. It is not surprising when you consider the access to the EU and that most Dutch people speak four languages. We have seen demand in the UK fall for new cars and several manufacturing plants are under threat from cheaper and more efficient plants in Europe. Whether these are because of Brexit is hard to tell but the UK is struggling. The UK did benefit from the global recovery in 2017 but it is now the worst performing G7 country. Household consumption has fallen to a six year low. House prices have started to slow. On the high street things are not looking pretty. With the closure of Toys R Us in the US, this had a direct impact in the UK. There are companies in the UK who are on the verge of going out of business or needing cash injections these include New Look, Carpetright, Moss Bross and Kingfisher (B&Q). There is a real possibility that the UK could fall into recession whilst the rest of the global economy grows. We don’t know the long-term impact of Brexit and this could be positive, but the short term paralysis within the government is having an impact on the economy. There are also concerns that the Bank of England will plough on with two rate increase this year and two next year, but many do not share their optimism. The fall in inflation might delay a May rise till August but it seems that rates will rise this year. This could have a negative impact on an already fragile economy. It is worth just mentioning the concerns on a Jeremy Corbyn and John McDonnell government. Businesses are worried because they come across as non-business friendly. They also seem to not respect property rights, the “rich” are rightly worried about higher taxes, and nationalisation causes greater concerns. Ultimately, although many proposals can’t be driven through in a five-year term a lot of long-term damage could be done to an already weak economy. Like Brexit the concerns and the reality can be very different. As the UK struggles the EU seems to be prospering. Germany still managed to function for six-months without a government. Italy remains in stalemate, it is worth remembering they have had over 60 governments since the end of the 2nd World War. The worries about Italy splitting away from the EU seem unfounded. France under Macron is rejuvenated; one fund manager mentioned recently that people in France feel like they are in a period of boom. Macron is pushing forward with reforms and seems to be taking the lead in the changes in the EU. Recent business surveys continue to show Eurozone economies growing at a faster pace than that suggested in official data, and that this is continuing to accelerate. In theory the EU should benefit from strong growth in the US, as there tends to be a natural demand for Eurozone exports. The risk is the escalating trade war, and Europe has already threatened to put tariffs on US products. Electrolux has put on hold a $250 million investment in a cooking factory in Tennessee and the EU Trade Commissioner is set to publish a list of US products they would target. This includes bourbon, peanut butter, cranberries and orange juice. One of the strongest economies is the Netherlands but both Germany and France are growing. Short term unemployment is at levels last seen in 2008, although there are concerns over longer term unemployment (12 months plus). It seems that Europe continues to post positive data following on from 2017, and perhaps they are getting some benefit from the uncertainty in the UK. Japan continues to be favoured by many and reforms continue, but Abe has been hit by a scandal linking him and his wife to cheap property sales by the state and a subsequent cover up by his government. There has been a large slide in opinion polls and this could see him leave. If he goes then there is uncertainty on the impact this will have on the reform programme and whether this could stall or reverse. In summary, there are a growing number of concerns from trade wars to the collapse of the government in Japan. Behind all this the economic data (except for the UK) is positive, and this should help the global recovery. The general feeling is that this has 2 to 3 years to run but there are factors which we can see that could make this shorter, and as we have said in the past it is often the things we don’t see that cause the greatest problems. We cannot ignore the potential for a full-blown trade war but there won’t be any winners. We have seen that US businesses will suffer, and potentially it opens the market to other businesses in Europe and Asia but a slow down in the global recovery hurts everyone. The domestic aspect of emerging markets is an exciting story. Many of the economies have younger demographics and are more accepting of technology. Some examples include Poland which is considered a leader in online banking technology, with one bank offering features such as 30-second loan approval via a mobile phone app as well as alerts offering custom advice and discounts based on a user’s behaviour and location. A Turkish Bank won a global innovation award in 2017 for its agricultural smartphone app, which helps farmers share data and information and get advice in real time and even acts as a platform for equipment rentals. 59% of patients living in emerging markets use at least one mobile health application or service compared to 35% in the developed world. And the largest maker of smartphones to power these online transactions is in South Korea. We have spoken at great length about China and there are genuine changes happening, especially around pollution and excess capacity. China has responded strongly to the US and it will be interesting to see how this plays out. But emerging markets is not just about China, both Brazil and Russia have posted lower than expected inflation figures which could see the case for easier monetary policy this year. Poland is benefiting from the Brexit effect with skilled workers returning, making it an attractive country for investors. The key for many of these countries is structural reforms and many are moving towards a self-sustaining path. India is one country to watch. Earnings expectations are stronger than expected and this reflects a reform programme going through. An example of this is subsidies; in recent years these have been cut significantly and are now paid directly to the beneficiary rather than agents or intermediaries. India has a long way to go, a new government could change everything and there are significant challenges including low productivity, bad loans and bureaucratic barriers but if they can make change happen long term this would be beneficial for the region. The gap in growth between emerging and developed markets is expected to widen in 2018 with EM growth expected to be around 5%. Inflation is expected to rise slightly and there should start to be a divergence of monetary policies across the EM space. There are elections to watch in Pakistan, Indonesia, Brazil, Colombia, Mexico and South Africa. Risks to emerging markets include protectionism, faster interest rates hikes than are already priced in, a strong dollar and political uncertainty caused by elections. In summary, many EM economies are starting to become more self-sufficient. The growth across EM is stronger than DM and we feel that the ability to embrace change through a younger demographic profile helps in the growth of many of these economies. There are risks, and protectionism is one, especially if we have a global trade war which starts to impact the global recovery. If this happens we all eventually suffer, and no-one wins. 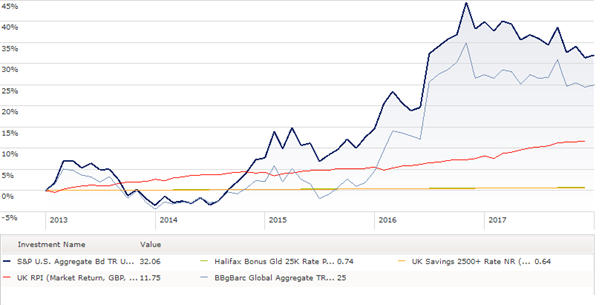 If the markets are correct and the Bank of England increases rates twice in 2018 and 2019 this is only likely to bring them up to 1.5%. This is still someway adrift of the 5% level in 2008. It is important to remember that although there is a need to give something back to savers, this level of increase would have a significant impact on an economy not used to rate rises. If the Bank of England moves too quickly this can impact house prices, and as we can see from the high street, those companies already suffering with a wall of debt will topple over. It is therefore a fine line between giving back to savers and not damaging the economy. An increase to 1.5% will affect some, but equally it wouldn’t really help savers. Any rise to previous high levels may not be for some years to come. One small piece of good news was decreased inflation. In summary, it seems that rates will likely rise, even if the economic data would suggest this is unwise. However, this will not be fast and cash savers shouldn’t expect anything significant soon. We concluded in the last review that the ride in 2018 would not be smooth. 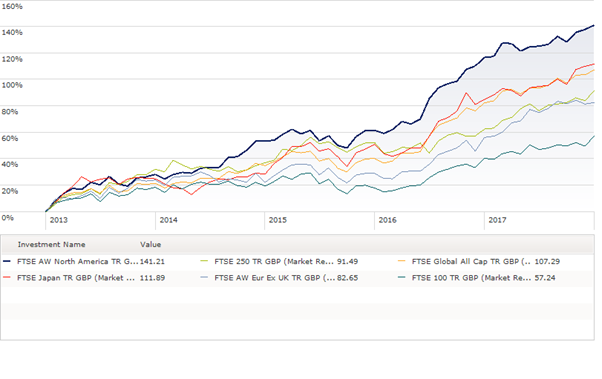 The FTSE 100 is down nearly 8% this year, and it has not been a comfortable time for investors. There are challenges ahead, especially around how the global trade war plays out. The actions of Facebook could have a negative impact and there are political concerns. But for all the risks that have come to the surface this year, the underlying fundamentals in most economies are good. Investors are nervous and that is no bad thing, but we have had a flat recovery until the last 18 months, this would imply that the recovery still has legs to run. We make no secret of our concerns over the UK economy but there will be a turning point in the future. We don’t know when that is, and many investors rightly see opportunities are easier to find elsewhere. In summary, so far 2018 seems to be playing out very much as we expected in terms of volatility coming into the market. We believe there are opportunities for returns, but equally if the downs cancel out the ups then 2018 could be a flat year.